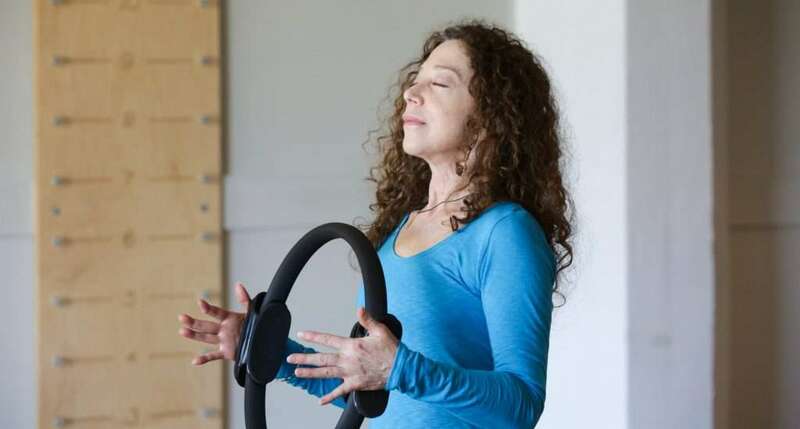 A year and a half ago, a new client Johanne White walked through the doors of Body Harmonics. She was petite and a bit nervous, but seemed dedicated to using movement therapy to help heal her body. Within a few months, we began seeing more and more of her. We had many conversations in passing and over time I had the chance to learn more about her incredible story and how Body Harmonics was helping her overcome physical and emotional pain. I asked if she’d be willing to do an interview and share her story with others. She agreed. This is definitely a must-read for anyone in pain. 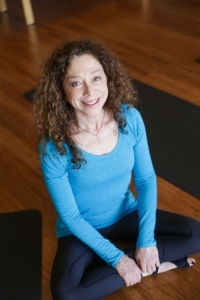 Johanne’s commitment and dedication to healing is incredible. She’s gone out on many limbs and overcome many obstacles. Below is just a small piece of Johanne’s fascinating story. I encourage you to spend a few minutes to read this interview I had with her and pass this on to anyone else you feel may benefit from reading it. Larisa: What brought you to Body Harmonics? Johanne: Oh my, that’s a long story! Before I came to Body Harmonics, my body systems were shutting down and the doctors couldn’t figure out why. They thought I had Multiple Sclerosis, but it wasn’t it. My entire spine was rotated and had damaged my joints, muscles, ligaments and nerves. This compromised my central nervous system and sense of balance when doing even simple day-to-day activities. I underwent several surgeries to repair damaged joints and the surgeries caused more damage and rotation to my body. I began to see a neuromuscular dentist, Dr Susan Huxtable. She was great! Dr. Huxtable did an assessment with me and determined a course of treatment that would “unrotate” the spine and provide stability to C1 (top of my cervical spine) which should improve alignment in the body. For many, this may sound a bit unfamiliar and strange as a treatment option, but it really made sense to me so I followed my gut and trusted the process. I also worked with Dr Tania Siquiera a NUCCA Chiropractor to help shift my spine while Dr Huxtable used dental orthotics to support my skeletal system and move me towards alignment. The first year I wore an orthotic on my lower jaw and it was modified weekly. Once I was more mobile I was ready to take the next step and find a safe movement and strength-building program. I knew without this my body would not heal as quickly or effectively. I chose Body Harmonics for my movement and strength training part of my rehabilitation because of the specialization in Neurological programming. I’m so happy I made the right choice. Larisa: Tell me about the journey you’ve taken at the studio. What programs and services have you used? What’s your experience been? How has it worked with your other treatments and therapies? Johanne: At first I started with Physiotherapy once per week. After the first month, I was able to add a couple Pilates privates to my weekly routine. A month later, I was done with Physiotherapy and was able to do four Pilates privates per week. It was a lot, but I was motivated to get strong. And I was making progress. Another month later, I began attending Core Essentials. It’s a spine-safe class that moves slowly and really helps you feel your core. Another month after that, magic happened and I tried a Muscle Activation Techniques (MAT) session at the Body Harmonics clinic and was completely blown away. Naturally, I added that to my weekly routine as well. My next step was to have Dr Huxtable operate on my tongue. It was tied and holding my body in a rotational pattern. This was another way to release and continue shifting my body into better alignment. I continue to undergo weekly adjustments with Dr Huxtable and a cranial sacral practitioner, Jennifer Bond the (both these practitioners are external to Body Harmonics). Just recently I was able to add a few more group Pilates classes to my weekly routine. It feels so fantastic to keep moving forward on this strength-building journey. One last piece to my puzzle, is Pilates teacher training. I’ve done a lot of work on myself and about a year into my journey at Body Harmonics, I took some educational workshops offered to Pilates teachers. From these workshops I learned so much I decided to take it a step further. A couple months ago, I enrolled in the Pilates teacher training and certification program. Perhaps one day soon I’ll be able to teach and give back to people. Larisa: You’ve been on a healing journey for a long time now. What would you say is the biggest difference you’ve experienced at Body Harmonics from other clinics you’ve been to? Johanne: They keep saying it, but Body Harmonics really does have an integrated approach to wellbeing. I’ve worked with many different practitioners and instructors at the studio and it was the first time that everybody I was working with communicated about what was going on in my body. All the Body Harmonics staff, Dr. Huxtable and Jennifer Bond were all on the same page about my progress, collaborated with each other and knew what steps to take next. Also, both Dr Huxtable and Jennifer Bond have come for Pilates and MAT sessions. They’ve become raving fans and refer clients to Body Harmonics. This means the world to me. I’ve fallen apart in the past when my past practitioners didn’t communicate and nobody was there to catch me. I’m so blessed my body healing team is now able to communicate openly for my wellbeing. Coming to Body Harmonics, everyone helped me feel safe, supported and strong. My blood is flowing freely and my feet are looking normal for the first time in years. These may seem like silly things to some, but are a HUGE deal to me! Larisa: That’s great. Some of the smallest seeming things can make the biggest differences to out bodies and wellbeing. Muscle Activation Techniques (MAT) is not a practice that many people are familiar with. Tell me a bit about it and what it’s done for your healing process. Johanne: Oh my goodness! It’s pretty amazing stuff. First of all, my MAT practitioner SueAnne is the absolute best. My body is hypermobile and constantly changing. When I start an MAT session, my pelvis is usually rotated and I have pressure in my spine. Also, when my dental orthotics are adjusted that really affects me. I’m really sensitive to any twists, kinks and imbalances in my body. When this happens I experience a lot of pain. SueAnne starts our sessions by taking a look at me and doing some muscles tests. This let’s her know what muscles are strong and which are weak. She uses touch, pressure and careful isometric exercises to help ‘turn on’ my muscles. As she works on me, the muscles in my body get rebalanced, my nervous system settles and I feel lighthearted. One crazy story is that I had severe stenosis in my cervical spine (neck) and my doctor wanted to fuse it. SueAnne did some work on the muscles at the top of my cervical spine at C1/C2 and they released. After that, my spine healed on it’s own and no surgery was required. Imagine that? Some days we work on my pelvis, other days on my spine, neck or feet. Even when she works the muscles in my finger it can affect how my neck and shoulders feel. It’s mind-blowing. SueAnne & MAT really supports the massive changes my body goes through every day. This sets me up for success. By the end of my MAT sessions, my muscles fatigue like I’ve been working out. Although my muscles are tired and worked, they’re not stressed. It feels like my body gains strength and my body knows how to hold itself together. Straightening out and rebalancing my body has improved my posture and digestive system. I’ve also got feelings in my body where I haven’t in 30 years. Without M.A.T, my rehab would be a lot slower and I’d be in a lot more pain. Larisa: I’m so happy you’ve had such great success with MAT. It’s sounds like something everybody should learn more about! Let’s go back to Pilates. What’s that journey been like? Johanne: We all hear that the body needs to stay strong to function, but I really saw firsthand how much my body loves to move and how much my muscles love to be stimulated. Sometimes things take time to click for me, but I know if I can feel or sense something once, even a little something, it can heal. My Pilates sessions not only make me strong in my body, but present little challenges for my brain. I like to learn and think and am excited to be able to have this extra stimulation. I’m like a kid in a candy store. I walk out of the studio with my head up and a spring in my step. My balance is better and I’m not nearly as afraid of falling. It’s terrific and I feel so much more confident. Something that was a bit surprising is how in-tune everyone is about the body and how it works. And they’re excited to share with me. I’ve learned a lot about anatomy, biomechanics and fun facts. For example, two great ways to help stimulate my pelvic floor are by putting my tongue on the roof of my mouth or working the arches of my feet. It’s a great example of how Pilates works my body from head to toe! Larisa: You’re now doing several classes a week in addition to your other therapies and Pilates private sessions. Tell me about that. Johanne: Going to class was a bit scary at first, but is now exciting. I’m actually doing 4 intermediate level group classes on the mat and Pilates machines. Doing a lot of privates has taught me a lot about what my body should be doing and feeling. Larisa: What else would you like to share with our readers? Johanne: I feel incredibly blessed to have such an amazing team supporting me: SueAnne, Andrea, Jocelyne, Danielle, Elizabeth, the front desk and everyone else I get to work with are top notch. It’s only been a year and a half and I’ve come so far in the gains I’ve made. Some of the words to describe what I have experienced from everyone I’ve worked with are gracious, supportive, positive, encouraging, knowledgeable, above and beyond, accommodating, passionate, learning, sharing, uplifting, fun, laughter, joy, bliss and tons of love! I could go on, but I think you get the point. I’ve also found an amazing community of people at Body Harmonics. I spend a lot of time there and have made many friends with clients and instructors. We speak about classes, go for coffee and even teacher training workshops together. It’s so amazing to spend time with like-minded people who are health conscious and interested in learning and bettering themselves in each in their own way. I’m happy to celebrate this special place. I hope everyone has a chance to experience Body Harmonics. Come for a class, try a private session or check them out online to connect with the gifts they offer the world. They really do care and I hope you get a chance to experience the power of Body Harmonics for yourself. I’m so happy you interviewed Johanne. I had asked her many moons ago if she’d be willing to share her story and she had said yes. I’m very glad it happened. The progress I’ve seen Johanne make has been truly remarkable. She is a beautiful strong woman inside and out and I hope this story can help others find hope. What an inspiring story. So glad that Johanne found BODY HARMONICS. Her persistence and discipline are also key ingredients to her transformation. Congratulations both! Johanne, it is amazing to see how far you have come! You always bring such a positive attitude with you to the studio. You show that anyone can achieve their goals once they put their mind to it, I look forward to seeing you teaching soon! !